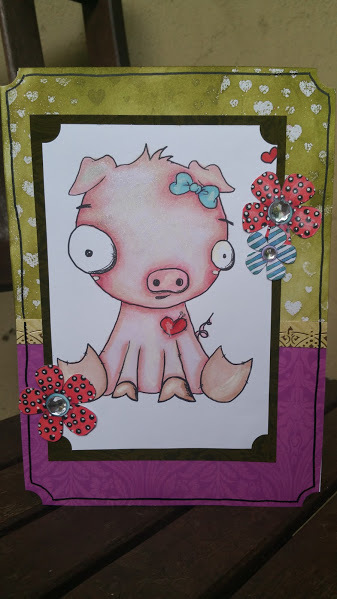 The Craft of Mimi: Elsa the piggy card. 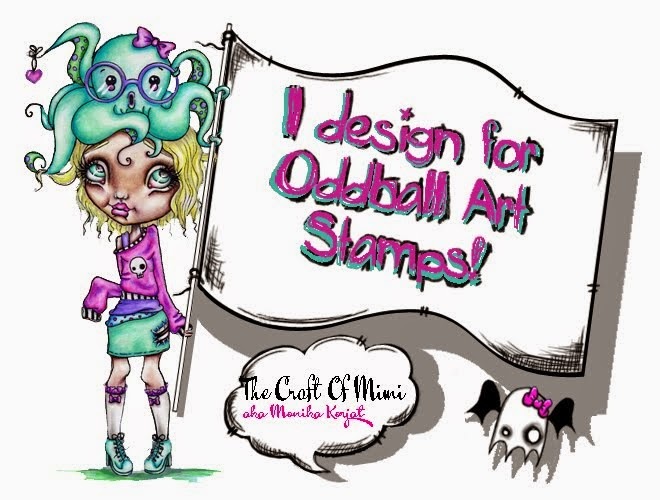 So I just looked at Oddball Art Stamps etsy store and had instantly fallen in love with this little piggy. I mean how can you not? If you are interested you can purchase her here. I used several techniques to finish this creation starting with embossing hearts background. Unfortunately the powder was quite old and with some remnants of other colours hence the lack of clear image. I coloured Elsa with my Promarkers using shades of pink: Antique pink, Baby pink, Dusky pink and Pale blossom. For the hooves I used Tan and Sunkissed pink. For the bow I used Duck egg and Cadet Blue and the little heart with Poppy and Red. I used some white marker to highlight some areas and the whole image was treated with clear Wink of Stella. 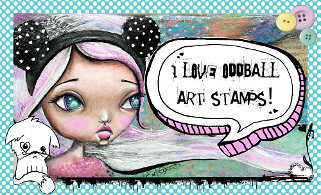 I used Ranger's Peeled Pain distress ink to colour the top part of the background as I based my layout on Mojo Monday's sketch challenge. With a little damp paper towel I wiped the excess of the embossed hearts. I cut the strip and the bottom of the background out of pattern paper and adhered to the card. I mounted the image on another dark cardstock attaching it to the rest of the card. The flowers were also coloured with Promarkers and the highlights and shimmer were added before glueing them into the card. The last step was to add the rhinestones to the flowers and the card was ready. Dream Valley Challenges - Embossing wet or dry. Passion for Promarkers - Flowers. Hope you enjoy the card as much as I had fun making it!